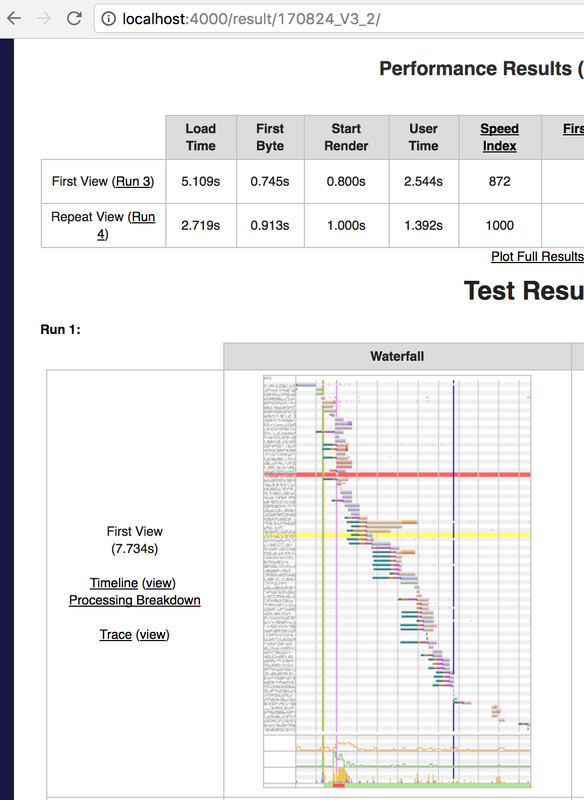 Recently at NerdWallet we’ve started using SpeedCurve to have a historical record of our WebPagetest results and shiny graphs to help visualize. It’s been a really great tool in terms of measuring performance for a large production website. However sometimes it can be useful to have an even tighter feedback loop when you are iterating on performance, to get a sense of what works and by how much. 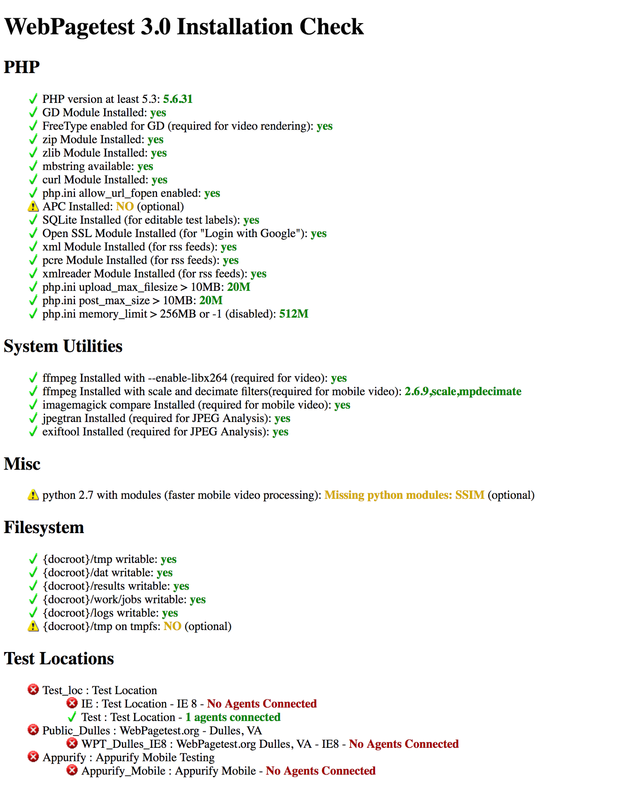 WebPagetest is awesome but I found the documentation a bit lacking so I thought I’d share into my experience in setting up a WebPageTest private instance for local development. If you aren’t super familiar with Docker (as I wasn’t), I’d recommend going through the tutorials to familiarize yourself. After you’ve gotten setup you’ll want to pull down the WebPageTest server and agent images. After pulling down the images you can create the containers. # -p specifies the port to expose. Just after running the server, you should be able to browse to http://localhost:4000 and see the webpage test private instance page to confirm it’s up. NOTE: Feel free to specify ports other than the one(s) I’m using. # -e specifies an environment variable. WPT requires `SERVER_URL` and `LOCATION` be defined. The SERVER_URL should be set to <your server>/work/ — it denotes the URL for the agent to poll. 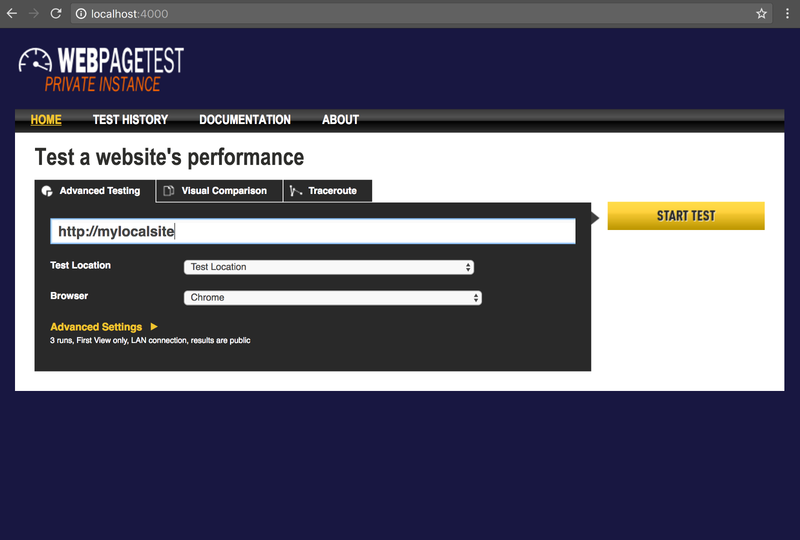 The LOCATION should match one of the locations defined in settings/locations.ini in the WebPagetest server. These define the parameters for that agent you are running (e.g. browsers supported, label, and other goodies). These environment variables are used in the startup script of the wptagent python app. NOTE: The agent will throw errors if it can’t communicate with the server. Try running the above command without detached mode (remove the -d) and it will spit out errors if there are any. If your agent is able to communicate with your server, you should see an agent connected for the Test Location. Easy enough. However if you’re on OS X like I am, there’s still a bit more work needed. we’ll need to implement a couple workarounds. You can remove traffic shaping by doing two things — setting a dummy value for connectivity in your settings/locations.ini file on your server, and setting --shaper none when the agent is starting up. I’d recommend creating a new Docker image based on the original WPT agent/server images but with modifications to the configuration. This defines a new docker image that pulls from webpagetest/server , replacing the locations.ini file with one that will work for OS X, particularly setting connectivity to remove traffic shaping. $ docker build -t local-wptserver . This defines a new docker image with a copy of the existing WPT entrypoint script that tacks on the --shaper none flag. $ docker build -t local-wptagent . Alright now we should be able to start up our local copies. You may need to first stop the existing docker containers.